Learn fly fishing basics in three easy phases. Designed for the beginner. 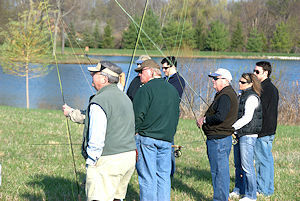 The school offers on introduction to fly fishing, basic equipment, casting techniques, playing and landing fish. Divided into three easy phases to allow you to gain the most out of each session. Phase I of our school is from 7:00 - 9:00 pm on the given dates. You only need to attend ONE Phase I meeting. You do not need to sign up ahead of time, simply show up on the designated date at 7:00 pm and you can get started. Please call us on the day of the particular Phase I class you plan on attending, just in case there is a last minute cancellation. If you do not have any equipment at this time, DO NOT purchase any. The instructor can provide everything you need for the first couple of meeting. Once you have had a couple of meeting with the instructor and some hands on time, you can then purchase your own equipment to practice (and fish) with and you will be making a more informed purchase. Time: Arranged, while store is closed in the evening. Content: Introduction to Fly Fishing and available equipment. Basic knots. This phase should answer any questions you have about fly fishing. Phase Two: Basic fly casting and still water fly fishing. Time: The student establishes class times with the instructor, i.e. by appointment. These are usually one on one instruction. Pond location is coordinated with the instructor at the time the appointment is scheduled. Content: Basic casting and pond/lake fishing techniques. Phase Three: Moving water and stream techniques. 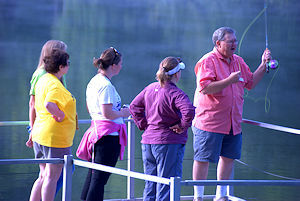 Content: Casting and techniques used to fish streams or moving water. Classes are usually on an individual basis, arranged around your schedule. Sessions will very in length from two to four hours. It is best to have your own equipment to practice between session however it is not needed in order to enroll in the Fly Fishing School. The cost for the entire school is $100.00 per person (all three phases). 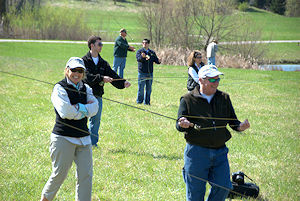 Upon completion of the school you should have the basic skills to start to enjoy the sport and art of fly fishing. 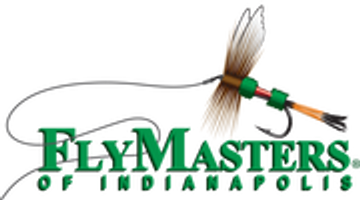 Contact FlyMasters at 317-570-9811. You can also send an e-mail if you have a question.